What exactly does ArsReco do? Our work consists of identifying and organizing unknown photographs from family archives. We do not identify people in the pictures, but places where the photography was taken. Which often allows us to assign a particular photo to a specific person, event, time. In this way we support genealogical research and discover unknown fragments of family history. Recognition of photography on the one hand is similar to an investigation (yes, it looks like the work of a film detectives and lasts 24 hours per day, because it is both physical search and the thought process – deduction, analysis and finally the preparation of a report); on the other – a journey into various parts of the world, but unfortunately – the majority of it takes place in front of the computer and in the archives. ArsReco is a relatively new service on the Polish market, but we have already achieved many successes. One of them is the recognition of a series of photographs made by Sarah Zacharek’s father. Sarah is an artist from England, the main character of the 5th episode of “Ancestry hunters“. In this program you could see the backstage of our work. And we we would like to tell you how exactly the process of searching for places from Sara’s photos was developing. First, we decided to locate two unidentified churches, which photographs are in Sarah’s collection. The search in Toruń and the surrounding area did not bring anything, so all of Poland stood open before us. The pond, clock on the tower and – interestingly – the Robur delivery van, which suggested that there is a shop nearby, proved to be helpful. During the search we always pay attention to details. Thanks to them, we found the first church in Goszczanów, the second, surprisingly, in the neighboring town of Lipki Wielkie. This is quite a long way from Toruń – in the Lubuskie Voivodeship. Located from photos, the Church of St. John Viann’ey on the Goszczanowski pond in Goszczanów and the church of The Nativity of the Blessed Virgin Mary in Lipki Wielkie allowed to identify quite a large number of other photographs of Sarah. This was possible thanks to the “law of series” we invented, the use of which significantly helps us in our search. We noticed that the same women in the same outfit appear above the pond, and in the yard of the house and inside it. 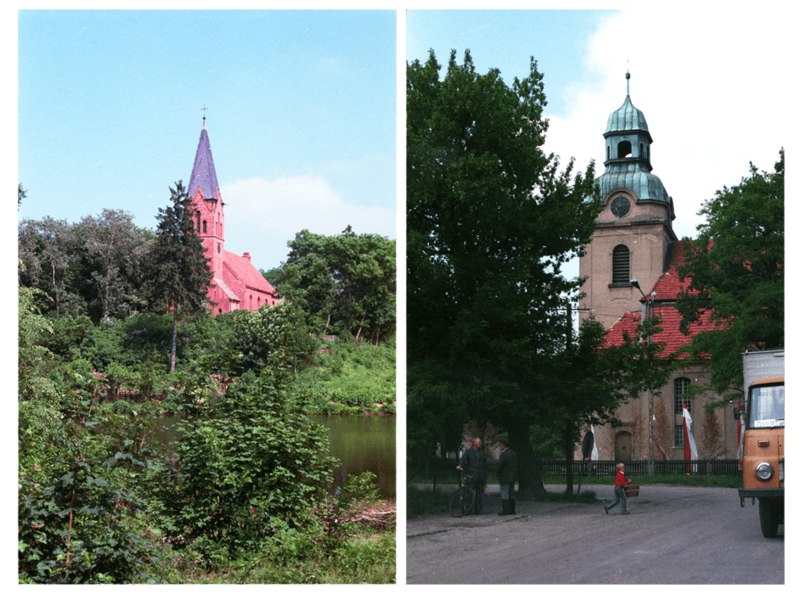 We risked a statement that one family reunion had to take place in one of the locations we located, and probably in Goszczanów, where women went for a walk near the church by the pond. The “law of series” helped to match many photos from the same place – from the Church of St. John Viann’ey on the Goszczanowski pond to a specific house in Goszczanów – and to discover that it was not a one-time family reunion, as indicated by the clothing, hair length, repainted shutters and bench. 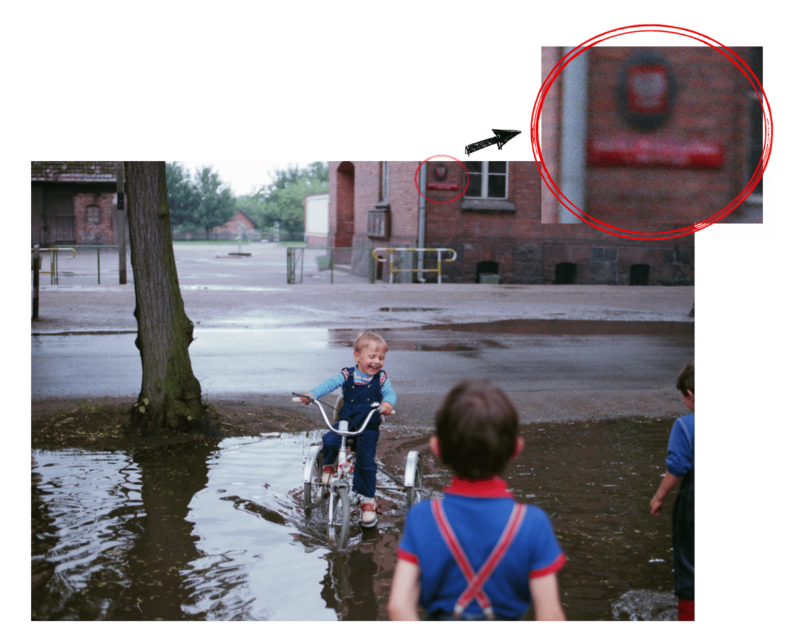 Next, we decided to decipher the place where the following pictures were taken. 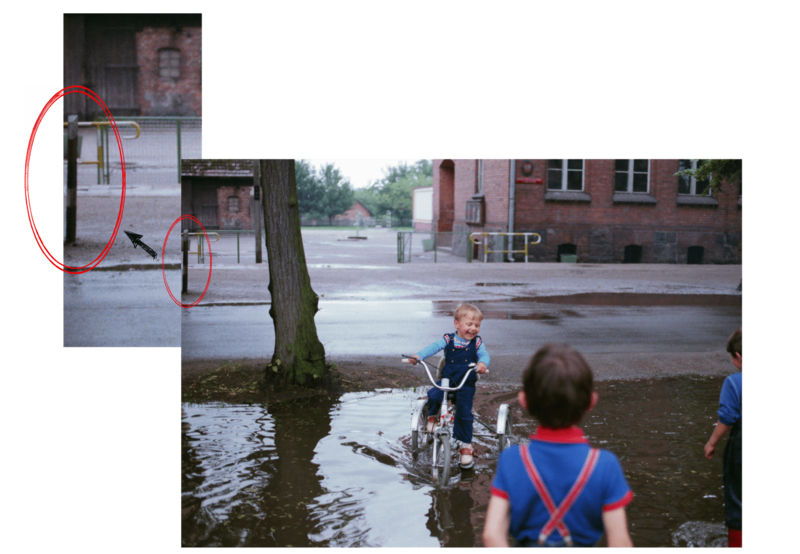 We knew that the photos of a boy on a bicycle are extremely important for Sarah. Some of them were taken in the yard of the house. Finding a single home or even a yard is not impossible for us, but it is an extremely difficult search. Here also the “law of series” helped us. We assumed that the pictures were taken on the same day, so the house with the yard and the school must be relatively close to each other. It is easier to find a public utility building, which is why we started locating the school building – a small elementary school functioning in the eighties of the twentieth century in a town with a single-word name, which we could deduce from a poorly visible sign on the building, probably somewhere between Lipki Wielkie and Toruń. Probably. Nothing easier! In the case of school, we worked in parallel. The number of primary schools in Poland is staggering. We have limited it, focusing only on old buildings with neo-Gothic architecture in the provinces neighboring Kujawsko-Pomorskie voivodeship and using the school censuses and satellite maps. The detail in the picture turned out to be helpful, i.e. picketage (kilometer post), which allowed to reject schools not located on provincial roads, which limited their number to just (!) – several hundred. Finally, after hard and intense searches – we were able to find the school building on the provincial road No. 181 in Drawsko in the Greater Poland Voivodeship, and thanks to this location, the house and the backyard of the house where the children were photographed. We did not make a mistake. All the above pictures were taken in Drawsko, and the house is actually near the school. The effects of our work and Sarah’s moving meeting with the boy from the photo you could see in the episode 5 of “Ancestry hunters“. The fact that our location was confirmed one hundred percent is an additional success for us and a great test of our work. We are full of admiration for Sarah, who decided to find places from her unspeakable photographs. She devoted a lot of time and work to it. Some of the places were located by herself, some of us – ArsReco, and thanks to Kinga and Karolina from Your Roots in Poland, Sarah Zacharek found her living relatives in Poland. Genealogy portals and programs – where to build your family tree?